Gogobot is one of my favorite new startups of 2010. The site first launched in November – it gives users an easy way to review hotels, restaurants and activities and share them with friends. It’s not cluttered with ads and it is extremely well designed. So well designed, in fact, that they are a finalist for the Crunchies Awards this Friday in the Best Design category. Our launch review and interview with cofounder Travis Katz is here. 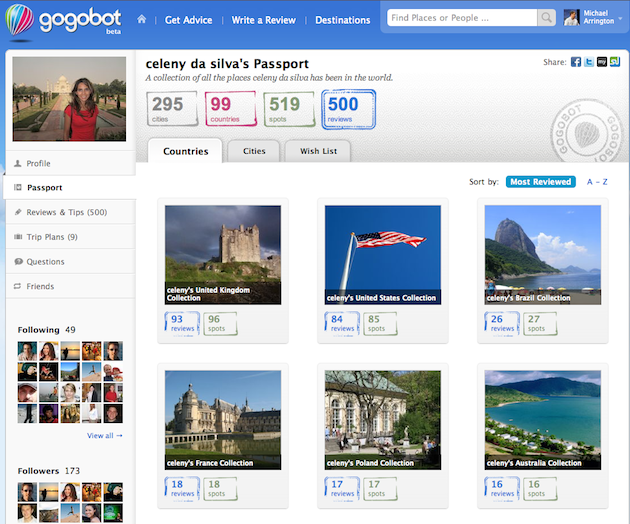 Today Gogobot is releasing a new feature called Passports. It’s more of a grouping of reviews, automatically, by location. It seems simple and it is, but it’s also a great way to see all of the reviews by a user for a given place. So if you find someone who’s reviews you trust, you can check out the rest of them, too. Here’s the Passport for Celeny Da Silva, a very active Gogobot user. She’s written 500 detailed reviews in 295 cities and 99 countries – clearly she likes to travel.